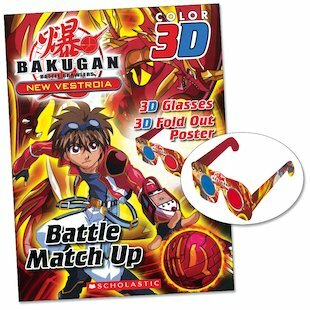 A battle bonanza in eye-popping 3D! Now the war between the heroes and the evil Vexos gets more real than ever before! Can our heroes dodge the dimension controllers, defeat the Vestals and free New Vestroia? Slip on your 3D glasses to see each dramatic scene leap into life! A truly amazing battle sensation, with 3D glasses and a fold-out poster.